Mullard - Amperex- Telefunken, manufacturing dates 1950s Metal base. More on the sound of these EL34s soon. I will start with 50 type tubes. These are usually ST shape 1940s. The in demand 1930 Globe types have the numbers, 150/Arcturus. UX250/RCA. UX350/Cunningham. 450/Deforest. These are in my opinion the best sounding tube ever made of American design. The most naturally real sounding tube i have ever heard. You don't hear a tube, you hear music. So good, as to be on a planet of there own, old school design (like pre 1935) tubes. These tubes where made for the expensive elite amps and radios of the day. Some are just brilliant, others just great so you need to get the right ones. I have about 50 of these tubes. I do not run them hard, 300v or less (around 3 watt). With this voltage they will last longer and sound better (and a big plus) will sound more relaxed. Rule is, run them only as hard as the watts needed. Back in the 1930s there where many RCAs manufacturing plants and you can tell them by the getter type and its placement. RCA 250 Globe hat getter. This tube type is sweet and airy, the biggest sound-stage in the RCA range, can be a little brighter than the other RCAs with a little less timbre, good on classical. RCA 250 Globe large foil getter. This tube type is darker sounding, has tremendous timbre, so real, solid flesh on bone, but a smaller sound-stage than the others, Great on male vocals, guitar piano, most important it is not white or bright at all. Maybe the best RCA 250 ever made, rarer than most. Cunningham UX350 Globe , This tube is exactly the same to look at as the RCAs, but is may as quite as good as the best RCA versions. More romantic less detail. But it it depends on the getter type. I believe they are made in the same factory as the RCA versions by RCA, so they will probably sound the same. Deforest 450 Globe, This tube lush very romantic, A huge sound stage. Some will say less accurate than the RCAs. Most later 1940 ST 50 shape tubes are very good, more on these and others later. 45 type tubes. These are usually ST shape 1940s. The more in demand 1930 Globe types have the numbers, 145/Arcturus. UX245 /RCA. UX345/ Cunningham. 445/Deforest. These are in my opinion the next best sounding tube ever made of American design. A Great Naturally real sounding tube. The best timbre of any tube worldwide. These tubes where made for the bread and butter radios of the day. I do run them hard, 200-250v (around 2 watts). There are 2 that stand out. Rogers 245 long plate globe 1930s. Made in Canada. This valve is a very pretty sounding tube, clean clear and so sweet, smooth upper frequencies, can be bright if not carefull with tuning the System, does not have the timbre of the RCAs, they sound more like some 250 globes than a 45, very opposed (sound wise) to the 245 RCA version below. Great on classical. RCA 245 Globe, This tube type is dark sounding. Can be a little rough and ragged in the upper frequencies, and is also not the cleanest 45 tube around, but it has the best timbre you will hear out of any tube, so real, so solid, real flesh on bone, Great on male vocals, guitar, not white or bright at all. . There are many 45 varieties, and you must get the right one. The black charcoal plate, circle plate globe (1930s) they have the inch long glass piece hanging from the filament support rods . The best 45 ever made along with the Rogers 45 long plate. You can see in the picture, these are the right ones, The blacker the charcoal plate the better, like the one on the left, only buy RCA 245s that have this identical construction. 2A3s. The supposed best in the 2A3s range are the monoplates. These 2a3s where made in the 1930-to 1933 as a elite audio or radio tube. Some say they stopped making them because of the cost of manufacture. I find 2A3s monoplates to be overrated sound-wise, very clean clear, big soundstage, To me they sound somewhat sterile and harmonically threadbare. They sound more like a modern tube design, (Mid 1930s on) they are not as musical or involving as the 50 tubes. The best ones i have ever heard are the Radiotron 2A3 mono plates, These tubes are very very good but imposable to find, i did have two mint ones a few years ago. I like the National union 2A3 monoplates, they sound more like a 245 valve. Rich darker full, but a little ragged. Of the 2a3 dual plates, the best is the black plate, 1940s with spring filament support. Next is the RCA dual black plate without spring supports. 2A3s dual plates (grey or even black) generally are industrial or military, not really intended for audio use. Pictured are 2 RCA 2A3 Monoplates. Fantastic Steve, just the sort of thing that makes this site worth being a member of. 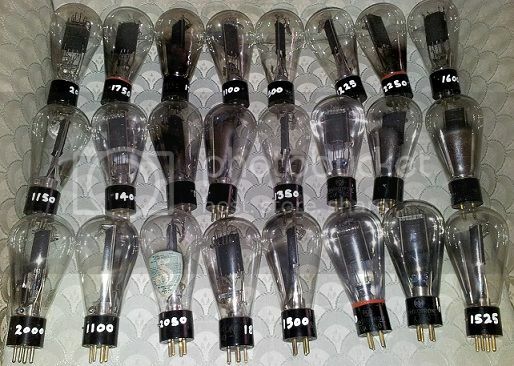 Part of my stock of 1930 globe 250s (type 50) There is Sylvania, Rca, Sparton, Ratheon, ect. Stevenvalve. Hmm, I can't see my favourite large foil getter there, where are they Steve? dared everyone to try and guess what tube it was. No one got it. Surprised me too. This was at just a few volts OP - I digress. Do you know which brand and model 12AX7 that was? Last sunday I fell in love with a for me new type of tube (new in my pre that is) the OA2. i wanted to know more about it and brand characteristics...I use an RCA....mr. The Cat does not think much of them but he is just an opinion...as the endresult is my judgement...but not much to be read unfortunately. I have some experience with OA2 gas tubes on one of my old preamps. Ones I liked best were the Valvo OA2 mesh plate tubes. They synergised best with the rest of the preamp and system to give a more 'delicate' sound. Plus they look the coolest too! Worlds best sounding rectifier. That is a tough question (is there even a best) In the last 40 years i have had, and heard almost all the rectifier tubes on this planet, here is a short list and they are all the best vintage makes, 5V4 5U4 5U4G GZ32 GZ34 5AR4 5R4GY GZ37 etc, including some in the metal base versions, and for you Western Electric fanatics the ridiculously expensive 1930s engraved base 274A- 274B rectifiers, $1800+ each NIB NOS. Well in my opinion, there is a best, and here it is. The Genelex gold lion u52, They are a higher voltage 5U4G class tube, and will fit straight into the 5U4G slot, all the pieces i have where made in England in 1960. They have been manufactured for Audio and come with an included data test sheet, and only obtained from America. Why they where only sent to the USA in 1960, i do not know. They are amazing valves they can sound clean and clear, but also rich, and full with beautiful timbre, smooth and sophisticated, not whitish at all like the Mullards, not course like the RCAs. Price if you can find them, about $600 give or take. They are very similar to the GEC Osram U52s and have that house sound, only better. The best rectifier on the planet. Hopefully I can snag one of these babies one fine day and hear how it sounds in my system. Your tube is not a brimar U52, it was made by GEC and branded brimar. GEC are also Genalex, Osram, and Marconi. There is a lot of rebranding out there in vintage valve land. I did compare both as I had both of them in my possession before I sold you my Brimar. The Brimar was almost 90% good compared to the Gold Lion and for the money I sold to you, it's a bargain. I wouldn't have sold it if I had a job and income coming in. Yup, it's the laws of diminishing returns at play again. Trying to get the last 10 or so % of performance unfortuneatley costs a lot. There is no arguement from me regarding the price / performance of cat 5 /6 it delivers an OK sound for low bucks, but if you want the high resoloution 'musical' repro then CAT 5 will simply not do. Mains cables are mostly about low resistance so plenty of CAT 5 cores will give this to you. So I throw down the challenge, make up some CAT 5 interconnects and swap them for your shop bought 'dedicated interconects' and see which one's get consigned to the bin. ( Answers on the back of a 50 dollar bill to xxxxxxxxx chez Vitavoxdude ). This is the same case with the U52 comparison. If you want to go for the ultimate/cost no object, the Gold Lion is the answer...bear in mind the additional cost of approximately $500, Steve was very lucky to get one sealed like that for $600. The previous one before that was sold for $700 if I recall correctly and it was USED! !